1. Enantiomers: The two non-super imposable mirror images. Molecules are classified as D form (Dextrorotatory ) and L (Laevorotatory) form depending on whether they rotate the plane of plane –polarized light clock wise or anticlockwise. 2. Naturally occurring amino acids are L (Laevorotatory) form. 3. D-form aminoacids are rarely found in bacterial cell walls and certain antibiotics (Gramicidin-S, Polymyxin, Actinomycin-D and Valiomycin). 4.N-acetylmuramic acid (NAM) is a D-aminoacid containing tetrapeptide. 5. 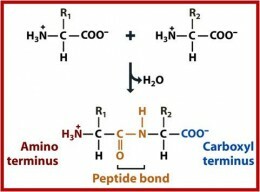 Peptide bond: covalent bond formed between the α -amino group of one amino acid and α -carboxylic group of other forming a -CO-NH- linkage. 6. All aminoacids have high melting point more than 2000C. 7. Soluble in water and alcohol, insoluble in non-polar solvents. 8. Aminoacids can exist as ampholytes/Zwitter ions. Arginine(Arg/R), Histidine(His/H), Isoleucine (Ile/I), Leucine (Leu/L), Lysine (Lys/K), Methionine (Met/M), Phenylalanine (Phe/F), Threonine(Thr/T), Tryptophan (Trp/W), Valine (Val/V). 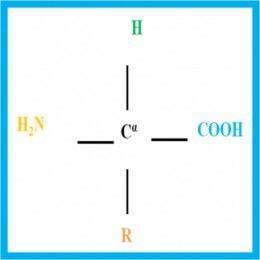 Memory tip: Any Help In Learning These Little Molecule Proves Truly Valuable. This stands for Arginine, Histidine, Isoleucine, Leucine, Threonine, Lysine, Methionine, Phenylalanine, Tryptophan, Valine. 11. Histidine and Arginine are essential amino acids for infants but not healthy adults. 12. 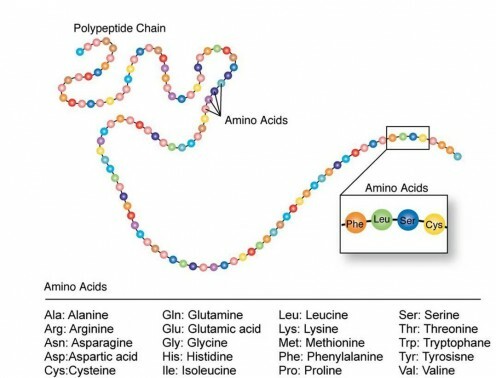 Cysteine and Tyrosine are considered to be semi-essential amino acids. 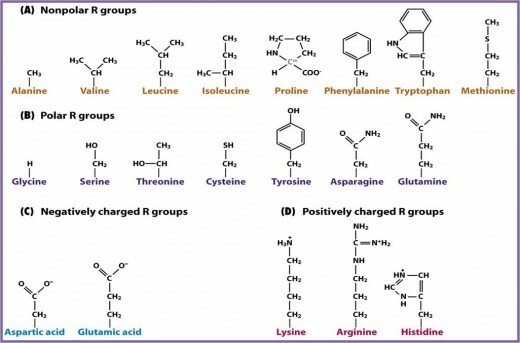 They are required by premature infants and adults who are ill.
13.Simplest amino acid: Glycine- An aminoacid without asymmetrical carbon atom. Glutamic acid -Most common aminoacid undergo oxidative deamination. 16. Neutral aminoacids: Glycine, Valine and Phenylalanine. 17. Alcoholic aminoacid: Serine and Threonine. 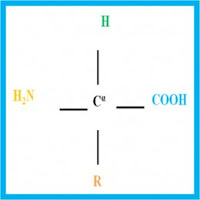 Histidine found in intracellular and extracellular fluids of most animals and plants. 22. Proline (Secondary imino amino acid) is rarely found within alpha helix segments. 23 Selenocysteine: 21st aminoacid present in human protein. · Collagen (A fibrous protein of connective tissue): 4 hydroxyproline, 5-hydroxyglycine. Ornithine and Citrulline are involved in the biosynthesis of Arginine and in the Urea cycle. 26. Glutathione is a co enzyme of oxidation –reduction reactions which consist of glutamic acid, glycine and cysteine. This chemical is important in preventing oxidative damage to erythrocytes. It's very helpfu. Easy to remember.